Our backyard renovation project is officially underway! We'd been neglecting our yard pretty much since we moved in a year ago, but fall is such an inspiring time of year in San Francisco that we decided to get to work. We started with a general plan and some inspiration photos (great ideas can be found here: Sunset, Desire to Inspire, Jeff Gamboni, Katy Elliott, and Flora Grubb). Last weekend we dug up everything except for the few small trees (pear, lemon, and fuscia) and my beloved yellow garden rose bush. We spent a few days, enlisted a few helping hands, and got all the weeds and dead things out (we filled about a dozen huge bags). Our yard is terraced and we've made plans for each little bed... the dog gets potty-central, the boy gets an elevated sandbox and mulched play area, Chris and I get a bricked patio with grill and seating area, a little raised bed for veggies, a wall of succulents, and the last bed will have dahlias (my favorite!!). The deck will get a good cleaning and then Chris will stain and seal it. There is also a little area for our compost bin, but that's been there and we're not changing it. Luckily, our landlord put a lot of time and energy into the yard before we moved in. The soil is amazing and the general structure of the yard is in great shape. I'm so excited that I won't have to make anymore Grey Gardens comparisons... it's going to be beautiful! I'll be sharing photos soon. I'm too embarrassed to post any before photos until we've made more progress. So for now, I'll just share some ideas we like. 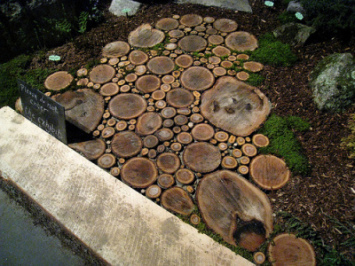 Photos: Sandbox from Domino Magazine, Vertical Succulent Garden from Flora Grubb, and this wood slice walkway from Katy Elliott's blog.